Risotto has always been one of my favorite dishes to make, especially in the winter. It’s the perfect base for meats like braised short ribs, in which I usually keep the risotto somewhat simple. This recipe, however, I made a little bit more special so that it can stand on its own at the Christmas table. I wanted to highlight mushrooms in this dish so I use them in two ways. I first take some brown button mushrooms and dice them up to be cooked within the rice. The trick is to really salt them generously while you sauté them. Mushrooms can be very bland if not salted well. 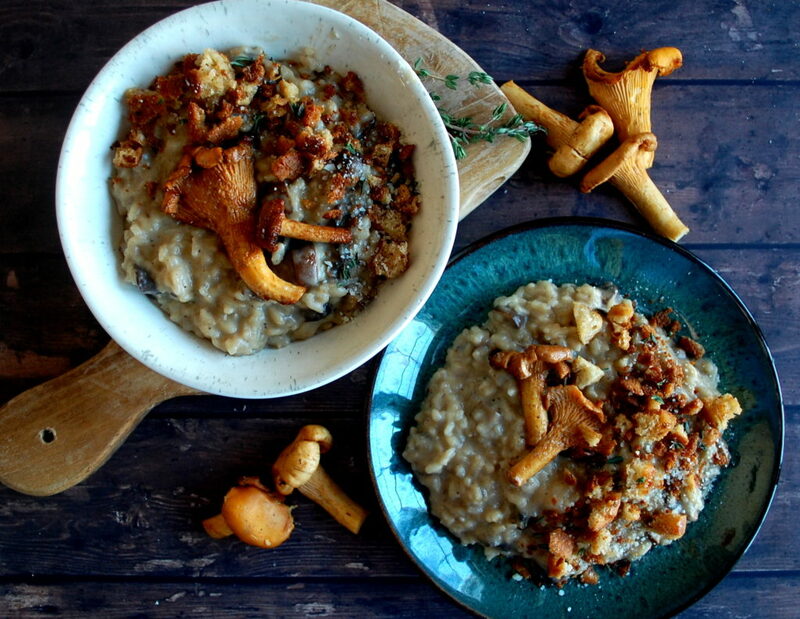 As the rice gets stirred and stirred….and stirred, the mushrooms soften and blend beautifully into the risotto as it thickens. Some Marsala wine makes things even tastier. The second addition of mushrooms comes from these gorgeous chanterelles I found at my local Whole Foods. If you can’t find chanterelles, choose any type of interesting-looking, somewhat exotic, mushroom you see. I don’t do much to these because I want them to keep their shape and delicate texture. A simple basting of hot brown butter for a few minutes will do. I use that same brown butter to cook what I like to call “ciabatta crumbs”. Basically I took some three-day old ciabatta bread that I had used for bruschetta, chopped it up roughly, and then pulsed it in the food processor until it was broken down into a mixture of bite-sized pieces and crumbs. The little pieces fry up in the brown butter so that they’re crispy and golden. 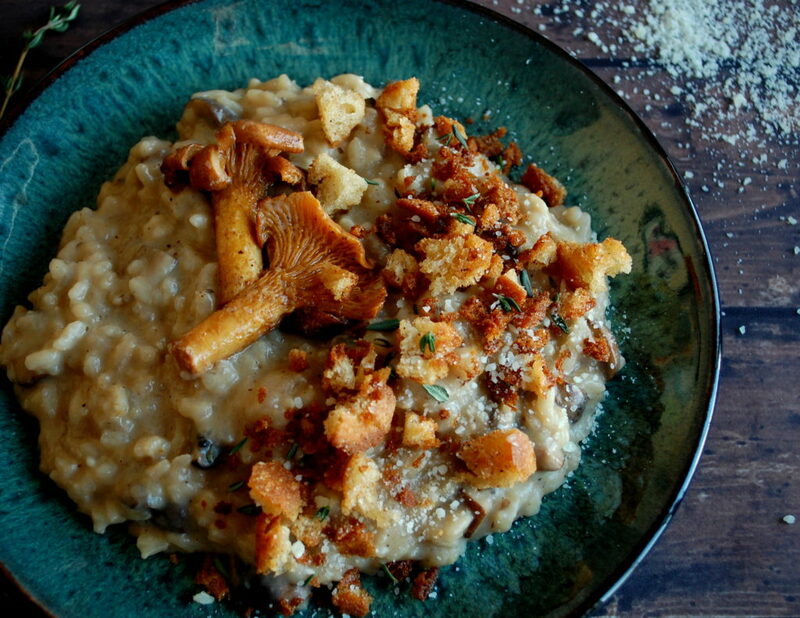 Between the chanterelles and the ciabatta crumbs, this risotto can shine on its own and be a delicious addition to your Christmas menu. Enjoy! In a small saucepan, heat the chicken stock and sprigs of thyme over low heat. Meanwhile, in a medium pot (I like using my Le Creuset), heat enough oil over medium heat to cover the bottom. Add the onion and sauté until translucent, about 5 minutes. Next add the mushrooms and let sauté until slightly brown and caramelized. Season with salt and pepper. Add the Arborio rice and toast for a minute or two. Deglaze the pan with the Marsala. Begin adding the warm chicken stock to the rice, about ½ a cup at a time. Stir with a wooden spoon until the first amount of stock is completely absorbed into the rice. Then add the next amount. Continue adding and stirring until all of the stock has been absorbed into the rice (discard the thyme). 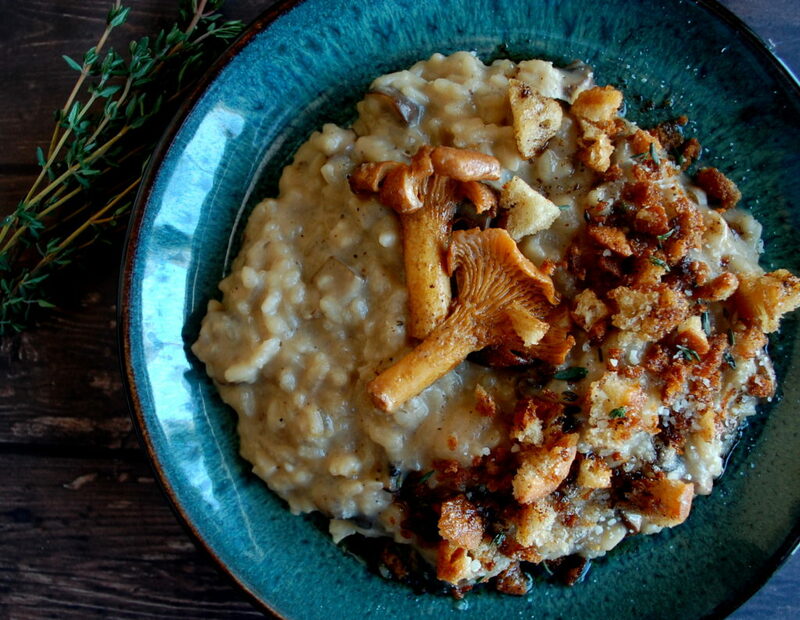 If the risotto is too thick, add more stock until you reach the perfect, silky consistency. It should take at least 30-40 minutes. To finish the risotto, stir in the butter and pecorino romano cheese. Taste for seasoning. Add more salt and pepper if needed. Meanwhile, add the butter to a small sauté pan. Heat it over low heat so that it can brown without burning. Once the butter starts to bubble, add the mushrooms split-side down. Baste the mushrooms for a few minutes while the butter continues to brown. Once slightly crisp and tender, remove the mushrooms to a paper towel-lined tray. Season with salt. Immediately add the ciabatta crumbs to the butter. Stir them often as they fry. Once golden, use a slotted spoon to remove them to another paper towel-lined tray. Season with salt. 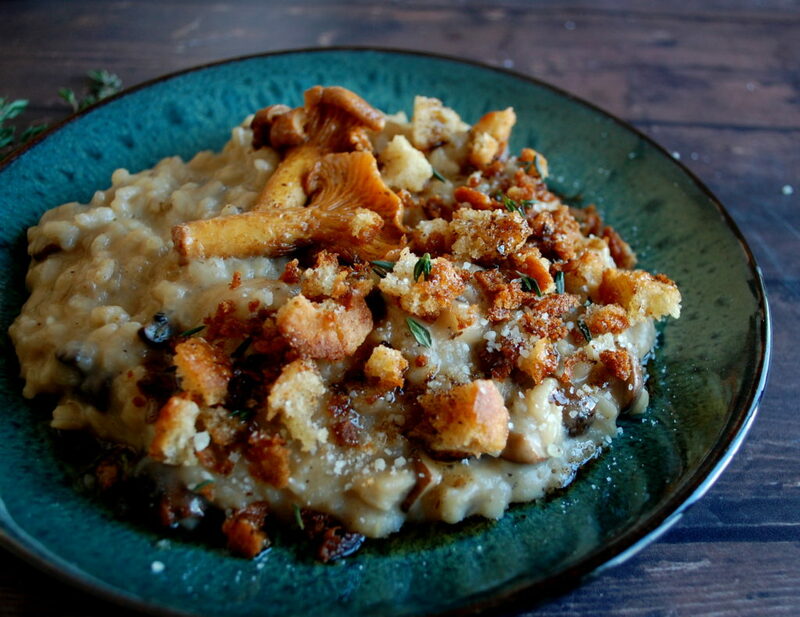 Serve the risotto with the brown butter chanterelles on top and a generous sprinkle of fried ciabatta crumbs. Drizzle any extra brown butter (or brown some more) over the top. Since risotto takes a good amount of time to cook, you can use a restaurant trick to prep it the day ahead. Simply par-cook the risotto about 75% of the way so that it still has a bite to it. Spread it out on a sheet tray and cool it down in the refrigerator. Reserve the last bit of stock that you don’t use. The day you want to serve it, pick up the cooking process by heating the risotto and adding more warm stock until you reach your desired consistency.